There’s one thing that can change the way your entire face looks and that thing is your brows. For many, many years I’ve been going to extremely violent foreign brow trimmers who seem to take great pleasure in inflicting as much pain as possible in a very public places – why oh why I chose to have my brows done in the middle of Uxbridge shopping centre I will never know. The experience of threading has literally left tears in my eyes and I’ve gradually wimped out of it all together in favour of the less effective, but a hellovalot less painful, waxing. 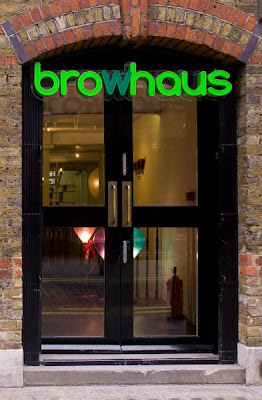 When I heard about Browhaus, a new specialist brow salon, opening up in Covent Garden I didn’t take much convincing to try it out. 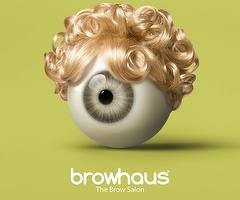 Browhaus is from the same company as Ministry of Waxing, who are known for their ‘sympathetic’ approach to getting rid of your furry bits. The fact that they refer to your ‘lady garden’ simply as ‘your bush’ made me laugh enough to feel that they would know what they were doing and how to put you at ease. The salon is on Floral Street, two minutes walk from Covent Garden tube, and is nothing like what you would expect from a salon. It’s green, wooden, bright, lively, noisy… everything you wouldn’t expect it to be, but it works. The clinicalness of a lot of salons put me off because I feel like I’m going to come out missing an ear or something – here the girls are welcoming, young and very friendly. I was taken to the brow lounge below which continues the cool interior design – wooden, spacious, very green and mirrored. The salon chairs are the best things I’ve ever experienced, being like massive comfy dentist chairs that warm up under your bum! I literally would’ve fallen asleep. But what about the actual brow treatment? 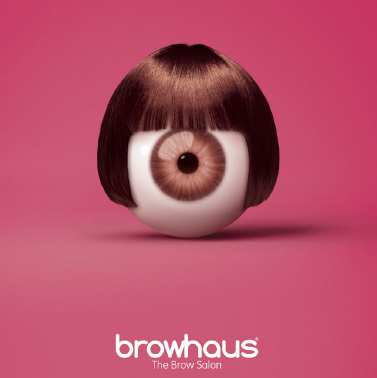 The main difference is that Browhaus do a combination of threading (to get the fine hairs out) and tweezing (to get the shape perfect) so you get a fab result – plus they actually get you involved, holding you brow in certain positions to pull the skin tight and make it as pain free as possible. Having a massive aversion to hair removal (I’ve already whimpered on about my dislike in another review) I can honestly say this was the least painful threading I’ve ever experienced… I didn’t even feel her threading the top or middle of my brows, and the underneath was only slightly painful. The girls in Browhaus were amazing, telling me exactly what they were doing and advising me on how to grow my brows into the perfect shape. This is exactly what modern grooming should be like – the music, mirrors and colour make such a difference to putting you at ease and getting a fab treatment. I would definitely go back again and again. Because I had such a fab experience Browhaus have been kind enough to give my readers 10% off any treatment… all you have to do is quote ‘London Beauty Queen’ when you book/go in to have your treatment. Fabulousa.